Comparing "Wealth Management" to "Financial Planning"
The vagaries of the English language are well-documented (and pronunciation and spelling have the same problem). But some industries depend on the lack of definition in the meaning of English words, with advertising and marketing leading the way. Misleading advertising practically lives off of the elasticity of the English language. The financial advisory industry has a very real problem in regard to the definitions of the services offered among its companies. Whether they worry about the confusion the industry language causes is another question. Put simply, if a firm says it offers “financial planning”, does an investor have a higher or lower expectation of services than he or she has from a firm which offers “wealth management”? Neither of those terms is clearly defined in the industry, and two companies offering the exact same services could operate under the different tags. So how is an investor supposed to discern which advisor provides more services? Is it the one who offers financial planning, or the one who offers wealth management? There may never be a clear answer to the question, but there are certainly clear perceptions, and those perceptions are studied in Spectrem’s new report Defining Wealth Management. Investors were asked to delineate the differences between wealth management and financial planning, with a slew of other undefined industry terms thrown in. “It’s unfair to investors that these service titles do not have clear definitions, but until they do, it is important to advisors to understand what investors think when they hear the terms used to describe a level of service among financial advisors," Spectrem president George H. Walper Jr. said. The study strongly indicates the confusion investors experience when dealing with the marketing of financial advisor services. 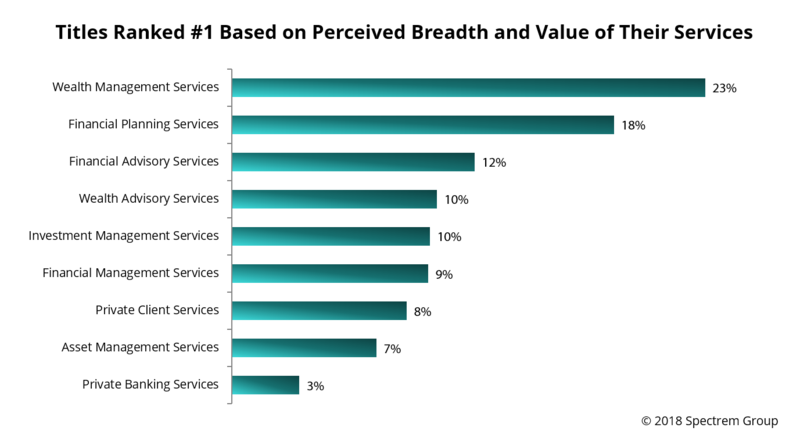 Asked to rank nine different services for the breadth and value of the services provided, based solely on the names they use to promote the business, 23 percent of investors chose “Wealth Management Services’’ as the No. 1 offering, while 18 percent selected “Financial Planning Services”. “Financial Advisory Services” got 12 percent of the No. 1 nods, and “Investment Management Services” and “Wealth Advisory Services” got 10 percent of the selections. The obvious indication is that the words “wealth’’, “financial”, and “advisory" have some sort of appeal to investors. However, when asked to place their impression of a financial services company’s description of services on a 0-to-100 scale, “Financial Planning Services’’ topped the average at 63.41, “Investment Management Services’’ came in second at 61.99, and “Financial Advisory Services" got a rating of 61.55 among all investors. Where is “Wealth Management”? It came in fourth at 61.45. There is not a lot of separation among the four, but “Financial Planning” did come out 2 points higher than “Wealth Management”. Does any of this make sense? More importantly, can advisory firms make sense of the significance of words in a description of services? Advisors cannot clear up the confusion that arises from the service titles, but they can provide a detailed list of services provided and make investors understand the breadth as well as the limitations of the services provided.